Since Japanese markets were closed, today USDJPY is chiefly under the influence of Fed’s representatives’ comments. The support rests at 115.110 with resistance at 116.120 which both lines are below the weekly pivot point at 116.870. The EMA of 10 is moving with bearish bias along the descendant channel and it is located below the EMA of 100 and above the EMA of 200. The RSI is rising towards the 50 level, the Stochastic is showing upward momentum and the MACD indicator is in negative territory. The ADX is showing a sell signal. The price is below the Ichimoku Cloud and above the Chinkou Span. The Tenkan-sen and the Kijun-sen are both showing horizontal trend. 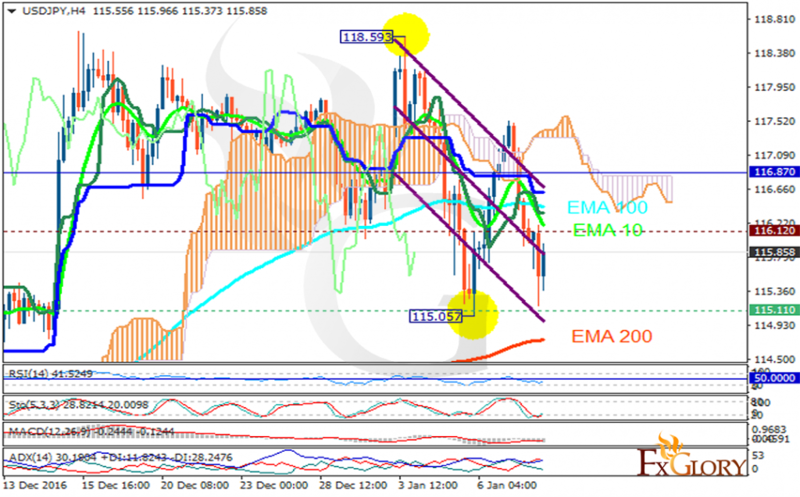 USDJPY will continue its upward trend until it reaches 118.00, then sellers can make profit from the pullbacks.